The RMS Model is a strong machine made by oversize rotor and rams and support roller mounted on hubs by strong double conics bearings. The structure is made by a high resistance double steel plate and the tractor connection can be sideways hydraulically movable. This particular structure and the high speed of the rotor allow an elevated speed of work. 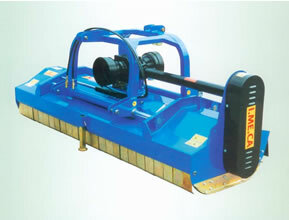 It is possible to use it on the front or on the back of the tractor through a double face PTO as per needs of user.